- Translations are fine as long as it is credited correctly including the links of the authors I have credited. - If you want to use this in a quest it should be ok but you should message me first to confirm. - You are Not allowed to manipulate any of my assets for your own armor mod. - You are allowed to do re-textures as long as the original file from here is required. 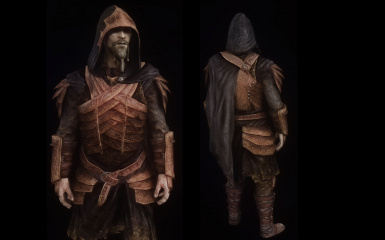 - I am not sure if I want this mod in armor packs yet so if you want to use it in a pack please message me and I may have made up my mind by then. Light Armor. All items Require the Elven Smithing perk. 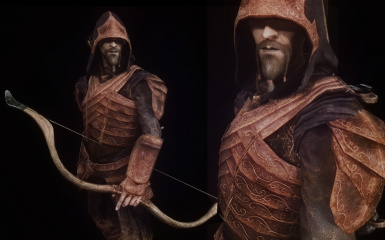 They can be created at any forge under the Elven category. The first 2 digits will be unique for you depending on what load order this is. Heavy Armor. All items Require the Advanced Armors perk. 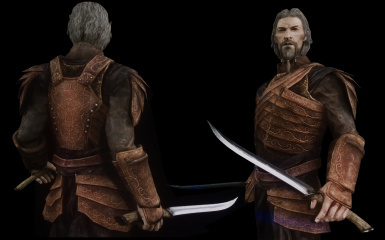 They can be created at any forge under the Elven category. Light Armor. All items Require the Glass Smithing perk. 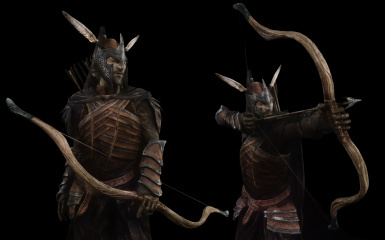 They can be created at any forge under the Elven category. Light Armor. 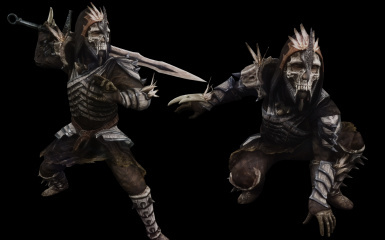 The Wild Hunt armors can only be acquired by defeating the Champion of the Hunt. 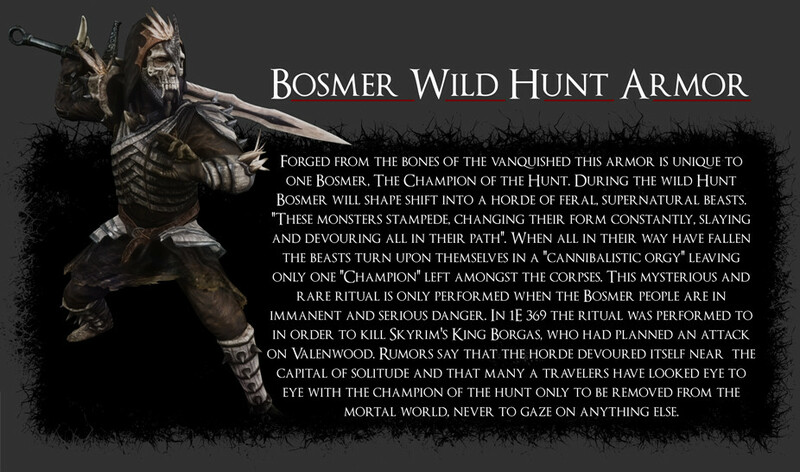 See Wild Hunt description above. Update 1.3 installation: Just make sure the .esp and the .bsa are directly in the data folder. Installation is very simple. Just make sure that the .esp file in inside the Data folder. This Meshes folder should be merged with the Data meshes folder and this texture folder should be merged with the Data texture folder. 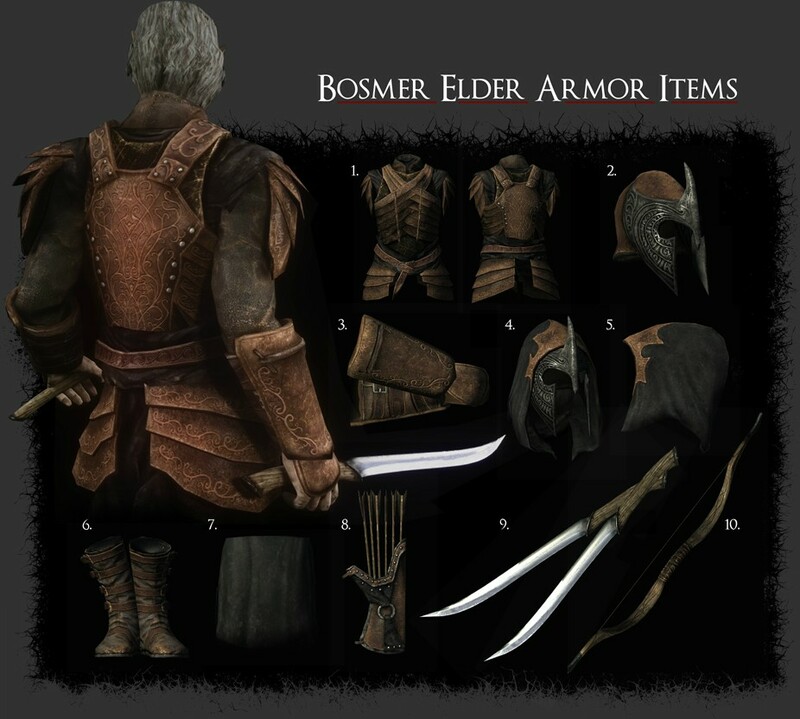 Path for Meshes: Skyrim/Data/Meshes/Armor/BosmerArmorMATY743/(All mesh files and some folders). 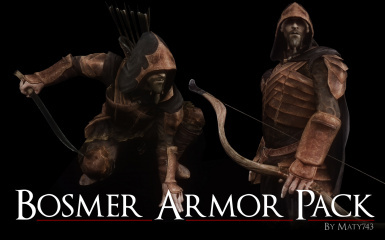 Path for Textures: Skyrim/Data/Textures/Armor/BosmerArmor/(All texture files). Please go give these contributors some Kudos and check out and endorse their amazing mods as without their help this mod might not have come to completion. - Firstly a huge thank you to [size=4pt]Arynn[/size] for allowing me to use his amazing chest/vest mesh as a base starting point for my armor. Without this asset it would have taken me a great amount of time to get the look I wanted and I may have even ditched the project all together. 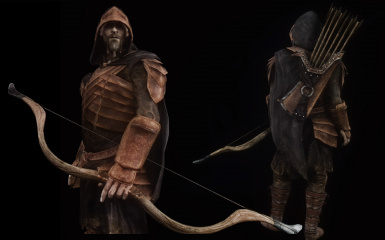 Check out his superb oblivion mods, especially the lotr ones. I just wish I had known about these when I was playing oblivion last. - Secondly a big thank you to [size=4pt]Isilmeriel[/size] for letting me use her Dagger meshes and some base textures. I absolutely love these Daggers and also the rest of her superb lotr weapon pack. 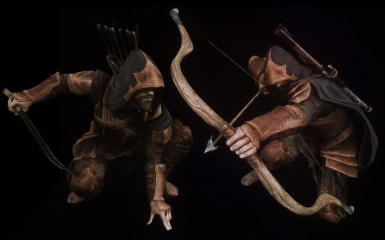 I highly recommend getting this pack if you do not have it already as it blends perfectly into skyrim. - I would also like to credit Bethesda for their great game and continuing to support the modding community. The developers of Blender and Nifscope. - For all cases in which permission is granted to use assets all credits must be clearly stated and have links. So you will need to credit and link to this file but also have the sub credits for this eg. Arynn and Isilmeriels need to be credited. - [EDIT April28 2015] You can use this mod and its assets in any mod under these conditions. It can not be used in a payed mod. You can not be using a service like patreon where you would be getting profit from releasing the mod. Normal donations are fine. As usual credit and link should be given. 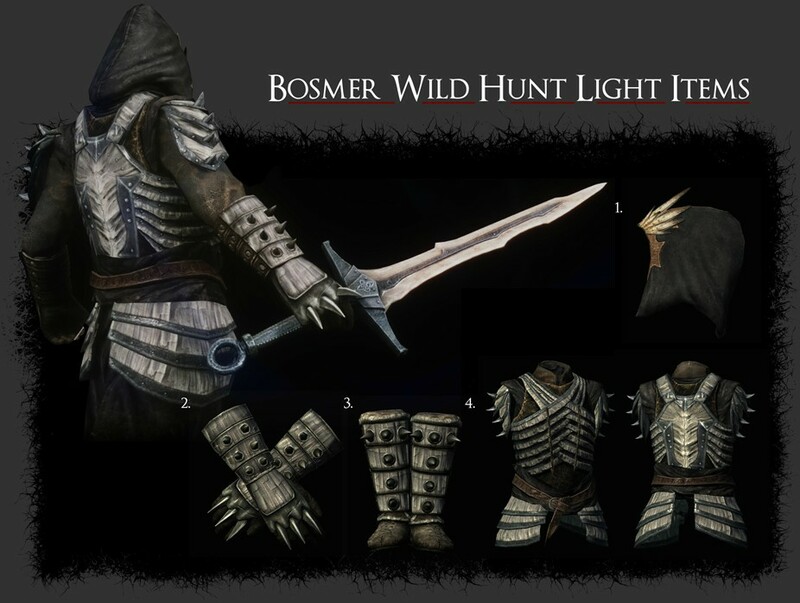 - Light Hunter armor is now lose in the little island. Mannequin has been removed due to some people having bugs with it. - File format has changed. Now I have saved as .bsa. This should solve the weird issue were files were unpacked twice inside each other. 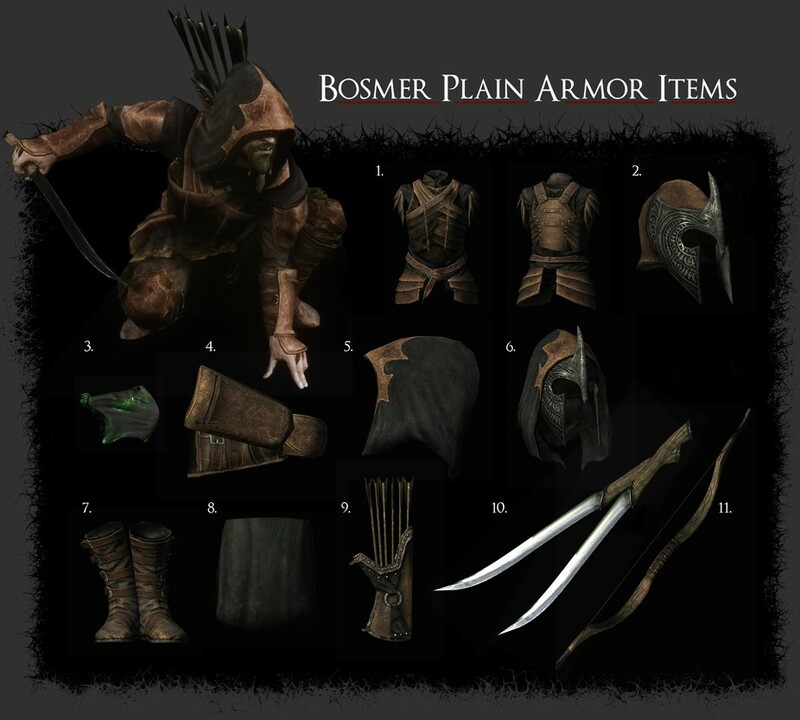 - All Bosmer Hunter npc's will now wear Bosmer plain armor. 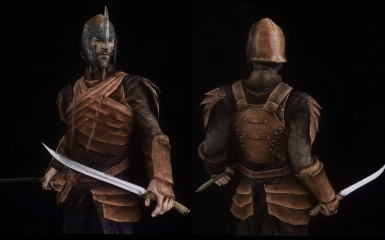 - Added armor to some Bosmer characters. 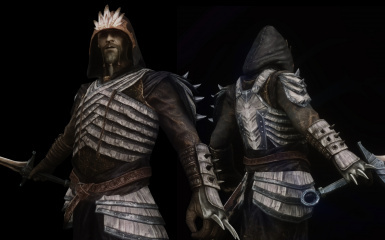 Depending on the character and the back story they might be wearing the armor or it may be in their home. 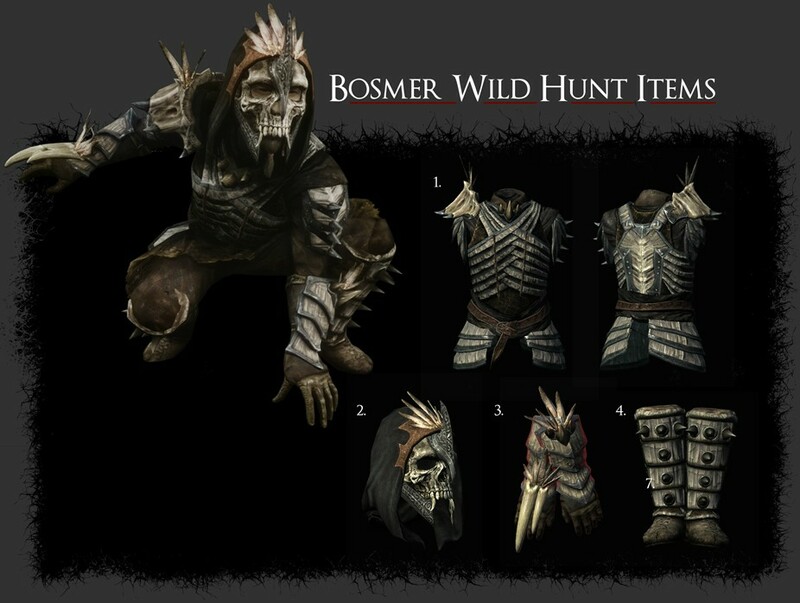 Only Bomser I felt suited the armor have been added. 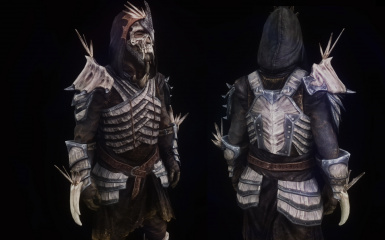 - Changed Angi from a nord to a bosmer and given bosmer armor. The back story doesn't say anything about her having to be a nord. 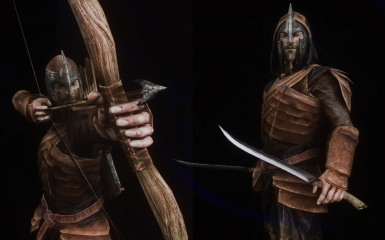 Since she is an archer trainer I felt she was better suited to be a bosmer. Sorry if this annoys some people. 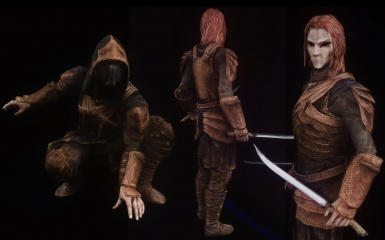 - Added a Hireling follower "Larethia" to Dead Man's Drink in Falkreath. 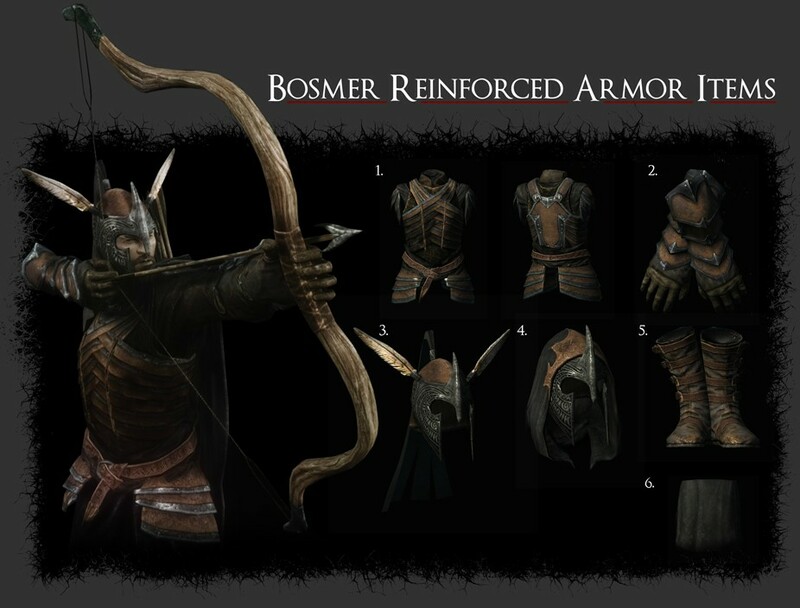 She is equipped with bosmer armor and weapons and will use dual daggers as well as bow. Her voice is the same as Jenassa Hireling.